If You Hate Fox News Why Are They One of Your Investment Holdings? As a member of Gen Z, the #neveragain movement stands as a symbol of the massive political change my generation can enact. We have the power to have our voices heard and we are demanding change. The leaders of the #neveragain movement, who are high school students just like me, serve as a source of inspiration and give us hope that we can change the world we are going to inherit. Unable to vote, but armed with a smartphone, David Hogg is taking on gun reform in a new arena – Corporate America. Hogg was in AP environmental science in Parkland, Florida, when a legally purchased AR-15 in the hands of a 19-year old began firing. Hiding in a closet, he recorded interviews of his fellow students in case they did not survive the event. 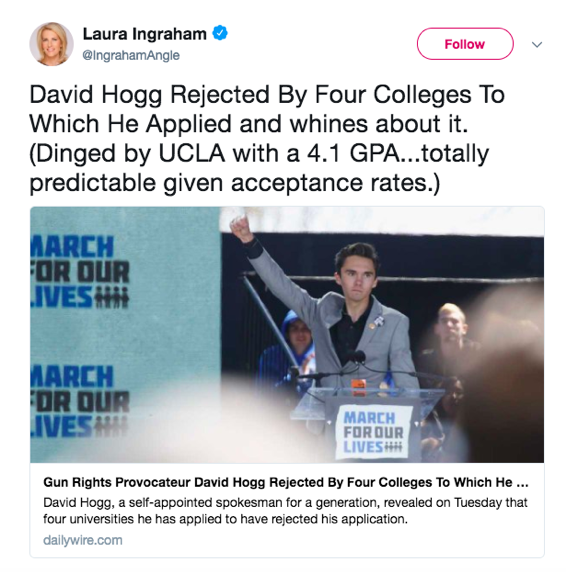 Since then, Hogg has been an integral voice in the #neveragain movement and has amassed a Twitter following exceeding 750k. While David and his fellow Parkland pupils have their eyes set on the 2018 midterm elections, the #neveragain movement has already engendered meaningful action by some of America’s largest corporations. We have seen a backlash against the gun industry that extends from gun manufacturers to consumer brands publicly distance themselves from the NRA. Most recently, we have seen David Hogg’s representation take action against Fox News in response to Laura Ingraham’s tweet on March 28th – see below. What is the intention behind Ingraham’s tweet? Personally, I see no other intention other than to discredit Hogg, a 17-year-old mass murder survivor fighting for change. As a true Gen Zer, Hogg replied the same day on Twitter, calling for his (then) 600k followers to urge advertisers to boycott Ingraham’s show. Less than a month later, 19 advertisers have dropped sponsorship of the show. Ingraham’s on-air advertising has dropped from an average of 14.5 minutes to about 7 minutes following the aftermath of the Ingraham’s tweet. In an industry reliant on advertising, that is not a good sign for Laura. Clearly, a growing number of consumers are repulsed by networks such as Fox News and Sinclair Broadcasting. Let’s not forget Fox News’ other disgraced hosts Roger Ailes, Bill O’Reilly, and Charles Payne who were all ousted from the network after news of numerous sexual assault allegations against them came became public knowledge. David Hogg can’t even vote in this country, but he and his fellow Parkland activists are using all the tools they have to be heard. They have uncovered a path to gun reform that skirts politics and directly asks our nation’s largest corporations to enact change. If you disagree with Fox News' stance on gun reform, does your investment portfolio reflect the same sentiment? Even with such animosity towards these networks, many investors - whether they are cognizant of it or not - continue to hold shares of these companies in their portfolios. In fact, anyone owning an SP500 index fund owns 21st Century Fox, which in turn owns Fox News. While it can be difficult to exercise ethical preferences within retirement plan structures such as 401(k) and 403(b), anyone owning passive index funds within taxable accounts can find actively-managed options that exclude specific holdings. Shivam Patel is the newest member of Stance Capital. A current high school junior, Shivam has a deep interest in mathematical finance and sustainable investing. In addition to his work at Stance Capital as the Editorial Intern, Shivam conducts research at Stanford University under Professor Fuhito Kojima.